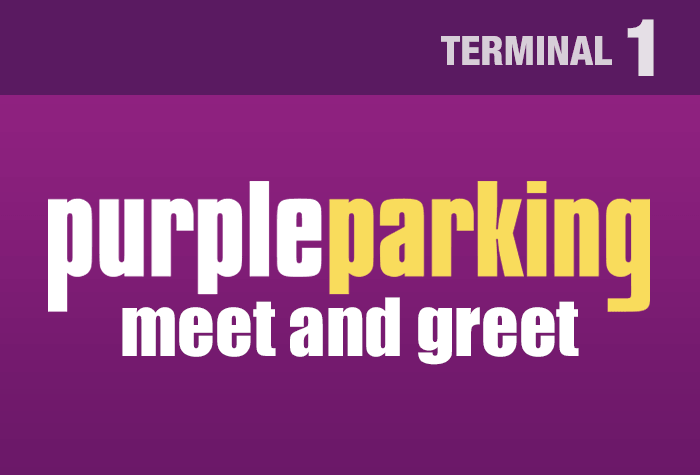 Purple Parking are now offering their handy Meet and Greet service from terminal 1 at Heathrow. Meet and Greet has got to be one of the most popular ways to park. It takes all the fuss away, with no transfers to catch or hunting for spaces. All you do it drive to the terminal, where you'll meet your friendly Purple Parking driver, take your baggage and walk to check-in. The driver will take your car to a secured car park, not far from the airport and it'll stay there while you're away. It's the easiest Heathrow Parking service around. A convenient service that takes all the stress out of Terminal 1 parking and includes the airport access fee in the price. Youll be met at the terminal by one of Purple's trusty drivers, who will take the car away for you. The earliest time your car can be picked up is 05:00. When you get back, your car is brought back to you. Drive to the Purple Parking drop off point and one of the professional drivers will park your car for you while you walk over to the terminal. While you're away, your car will be stored in the secured car park, which is surrounded by a high fence and has floodlighting throughout. CCTV is in use and guards patrol the car park 24 hours a day. So much has been done to look after your car that the car park has won the police Park Mark safety award. When you get back simply call purple parking to let them know youve arrived, then your car will be waiting for you outside the terminal, so you can make a quick exit. It's seamlessly smooth. All this for what is often our lowest price for parking at Heathrow - Purple Parking is perfect. Make your way to the Short Stay car park, opposite the terminal. A driver will meet you there and park your car for you in Purple's secured car park. When you get back, your car will be waiting for you where you left it, along with your driver and keys.